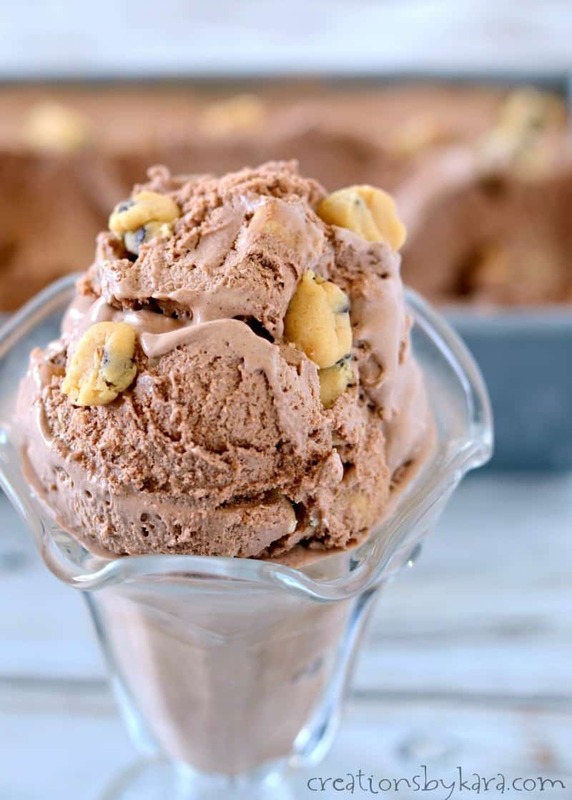 Chocolate Cookie Dough Ice Cream – rich and creamy chocolate ice cream with chunks of eggless chocolate chip cookie dough. A yummy chocolatey update on a classic ice cream! Truth be told, cookie dough ice cream has never been one of my favorites. Which is completely strange, because I love cookie dough. And ice cream. Just not together. Every brand I’ve tried just seems overly sweet to me. But this chocolate version? I’m a fan! The richness of the ice cream is a perfect compliment to the sweet chocolate chip cookie dough. This is a custard based ice cream, which makes it extra rich and creamy. But you will need to plan ahead, because it needs time to chill. 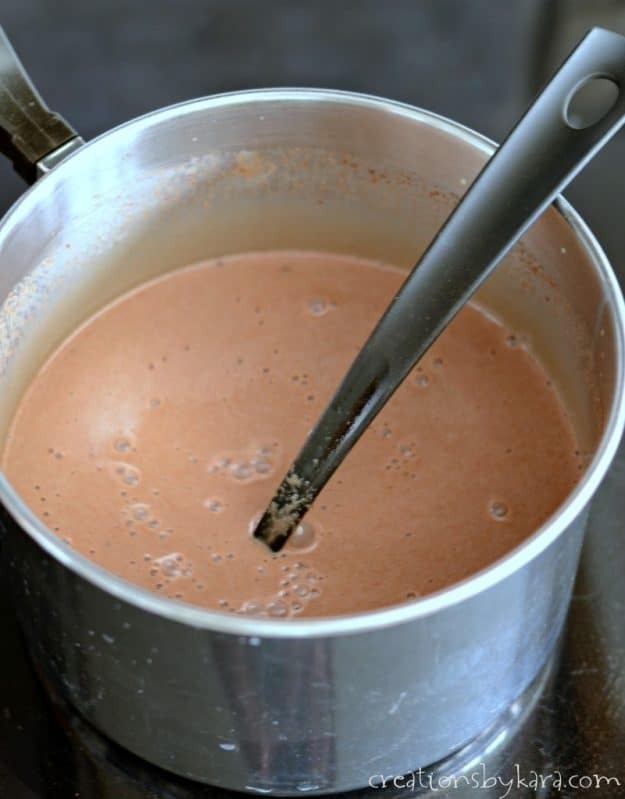 You start by cooking the cocoa, sugar, milk, half the cream, and egg yolks in a heavy saucepan over medium heat. Make sure you whisk constantly so it doesn’t scorch. A friend gave me a spiral whisk years ago, and I LOVE it for making sauces. If you don’t have a spiral whisk, I highly recommend getting one. This whisk on amazon is similar to the one I have, but you could also get a metal version. 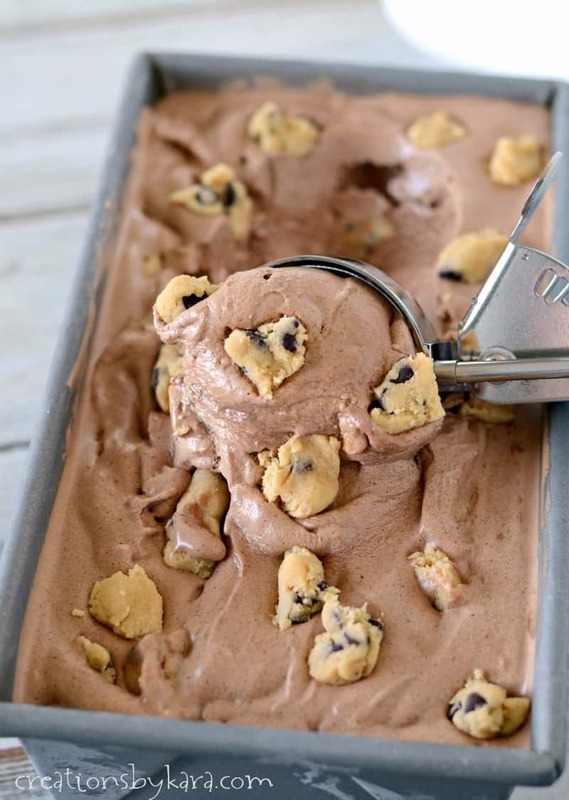 While your ice cream base is chilling, you need to make your cookie dough. This version is egg-free, so it’s totally safe to eat! I recommend using the mini chips so it’s easier to bite into after it’s frozen. After you get it all mixed up, break it into chunks and freeze it. 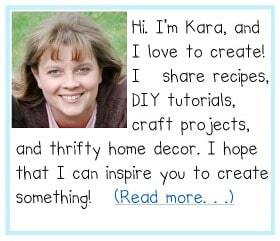 I just put mine on a plate, then covered it with plastic wrap when I popped it in the freezer. After you have frozen the base in your ice cream maker, pour it into a freezer safe container (I used a bread pan), stir in the frozen chunks of cookie dough. Cover it and freeze it for 4-6 hours, or until it’s stiff enough to scoop. Doesn’t that just look amazing? I have a bunch of cookie dough fans at my house, and this ice cream was finished off in the blink of an eye. 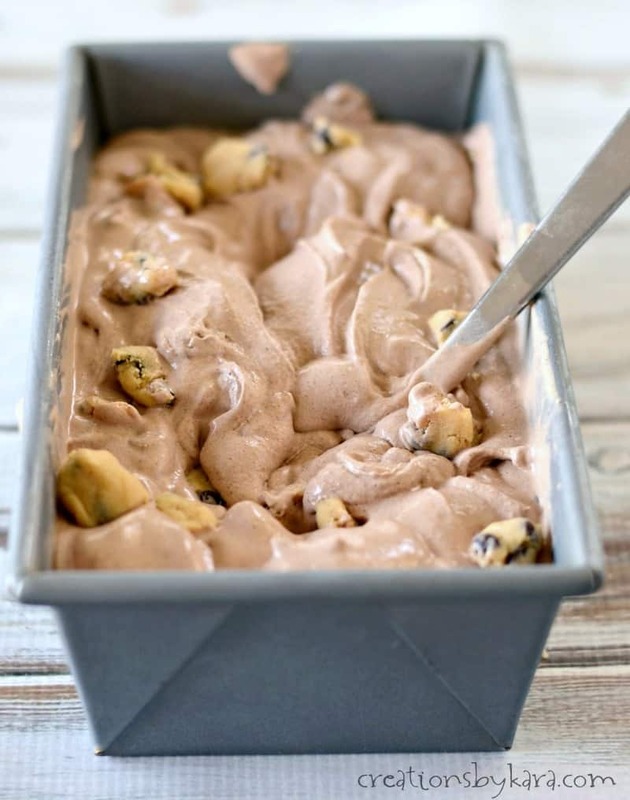 It is so rich and creamy, and it’s packed with plenty of cookie dough chunks. In fact, I didn’t end up using the entire batch. Which was perfect, because everyone wanted a sample of the dough! 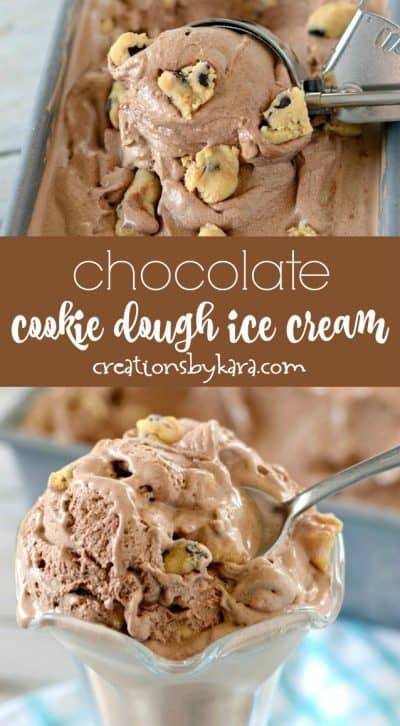 If you love cookie dough ice cream, but are a serious chocoholic, this is the ice cream for you! 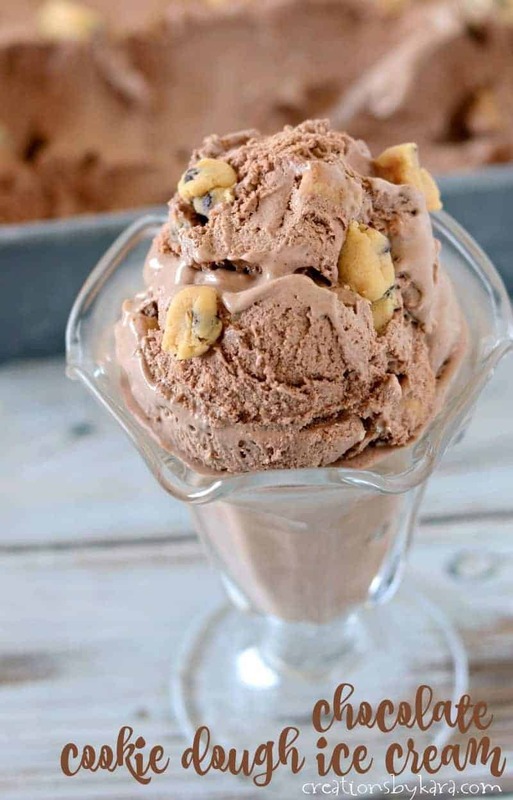 Rich and creamy chocolate ice cream filled with chunks of cookie dough. Whisk together cocoa and sugar in a heavy saucepan. Slowly whisk in milk and 1 cup of the cream, then whisk in egg yolks. Whisk till smooth. Cook and stir over medium heat till temperature reaches 170-175°. Mixture should barely come to a boil. Remove from heat and add salt, chocolate chips, and vanilla. Stir till chocolate is totally melted and mixture is smooth. Pour through a fine meshed strainer to remove lumps, then stir in remaining cup of cream. Chill for several hours or overnight. 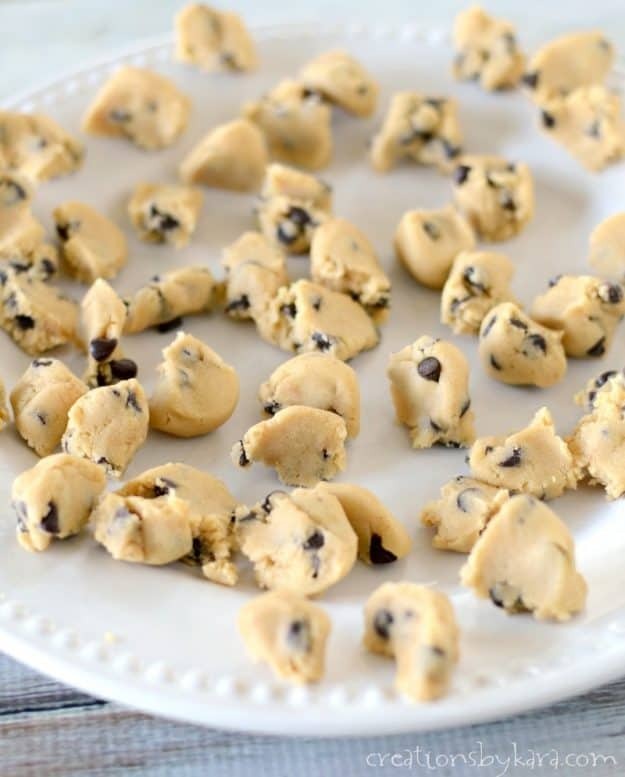 Prepare cookie dough, break into small chunks, and freeze. Freeze ice cream in an ice cream maker according to manufacturer's instructions. Pour into a freezer safe container and stir in cookie dough bits. Freeze ice cream for 4 hours or till stiff enough to scoop. Beat together butter, brown sugar, dry pudding mix, and vanilla in a small bowl. Stir in the flour, salt, and chocolate chips. Break into small chunks and freeze. Love chocolate ice cream? 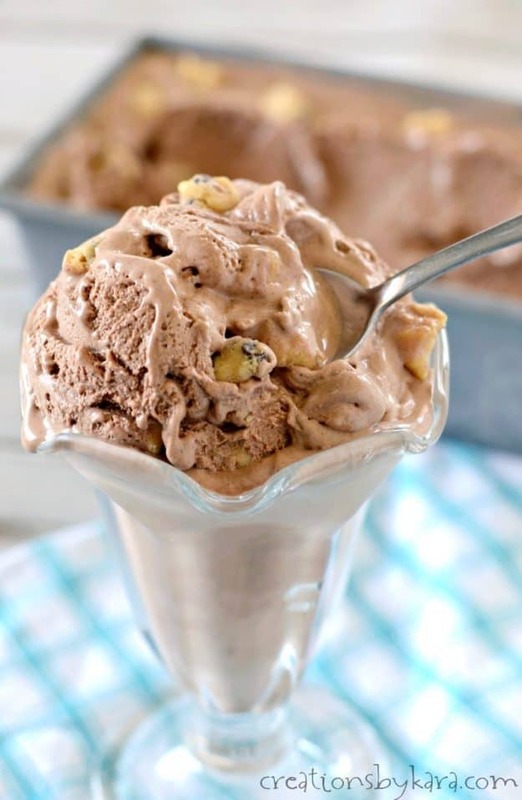 You are in luck, because today is National Chocolate Ice Cream Day. Do you need a better excuse to eat a bowl of ice cream. I don’t think so! 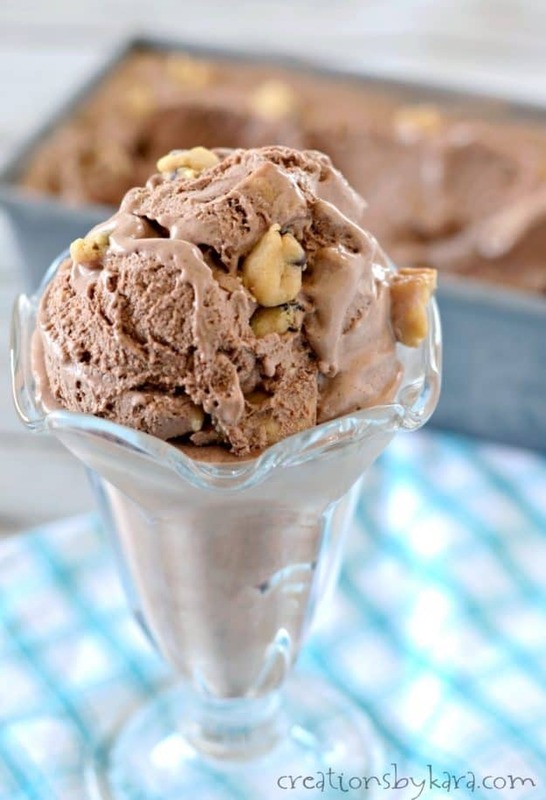 I’ve teamed up with my fellow Celebrating Food Holidays bloggers to bring you 13 recipes for chocolate ice cream. Grab an ice cream scoop – here we go! 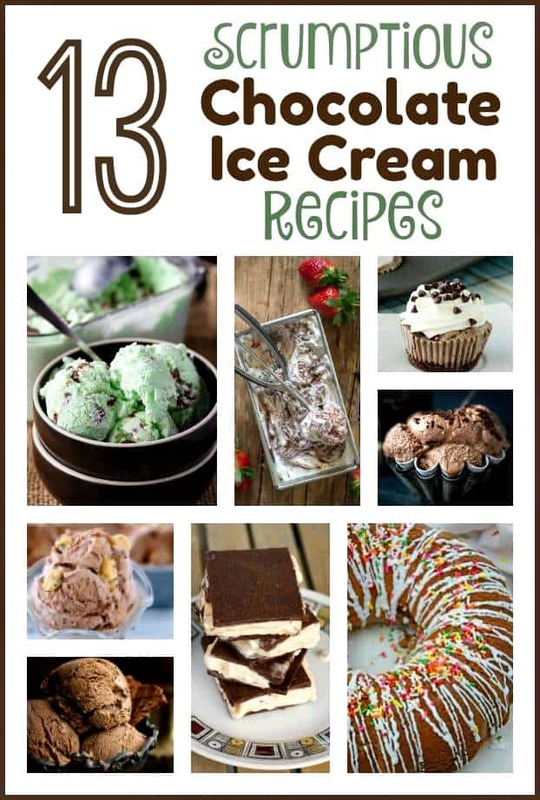 You can see all my ice cream recipes HERE. When does the remaining 1 cup of cream get added? Sorry I forgot to add that. You stir the last cup of cream in right before you chill the mixture. I have updated the instructions. Thanks for letting me know! Wow, this ice cream is delicious! Thanks so much Mari, I’m glad you enjoyed it!